As our world speeds up, becoming increasingly complex and crowded, the number of people who believe the future will be better than the past steadily decreases. Most of us feel we are working harder for fewer rewards. The all-too-common result of this bleak vision of our lives, is chronic stress and the symptoms it creates. The purest antidote for stress is Deep Relaxation. Unfortunately, this concept is eihttp://drmiller.com/wp-content/uploads/2012/09/Browse-Button.pngther foreign, or poorly understood by most of us. When we feel the power to control our lives slipping away, we become less comfortable with change. We fear losing what little we have. This produces an inner tension and defensiveness, a holding-on that resists change, even positive change that promises healing. It is in this seemingly no-win situation that deep relaxation methods are so enormously beneficial. After about 10 years of practicing this new kind of medicine, Dr. Miller began to comprehend that, whether people are dealing with quitting smoking, cancer, anxiety, or arthritis, there are profound similarities in what they need to learn about themselves. Regardless of the symptoms, the critical phase of deep healing involves similar shifts in people’s beliefs about themselves and the world—a shift toward greater self-realization and self-esteem. He discovered that a particular way of relating with his patients heightened their own level of knowledge. The most profound self-healing occurred as they experienced these heightened levels. A central feature of the relationship that develops between Dr. Miller and his patients is a sense of safety. He has heard people describe the feeling again and again. They call it a deep, pervasive safety that allows them to give themselves permission to relax, to let go, and to trust his guidance while in this deeply relaxed and open state. This trust is particularly important since the effectiveness of the deep healing techniques may involve reliving past experiences that were particularly traumatic. For example, in this deeply relaxed state patients have been able to relive, and release themselves from, the terror of being beaten by neighborhood bullies, the shame and rage of being raped by an uncle, or the abiding grief and horror of being forcibly separated from their family in a concentration camp. Through deep relaxation exercises, we can learn what needs to be learned at the intellectual and spiritual levels, while not overtaxing our systems physically and emotionally. The ability to relax and inhibit certain emotional reactions through relaxation therapy, along with the power to evoke and strengthen certain other emotions, can enable us to make ever more conscious and rational choices. Mastering these internal skills enables us to feel our feelings, learn from them, and continuously modify them to produce health and wellness in our day-to-day lives. By continuing to do these things, we train our own internal expert systems. Gradually all the lower levels of system (muscle tension, glandular secretion, and emotional responses) are restructured according to this wiser and healthier framework. From this point you will be able to make better decisions, taking feelings into account, with less need to make a conscious effort to do so. In Dr. Miller’s medical practice, his task is to help people experience deep relaxation and healing, not to merely understand the principles. Similarly, to fully receive what this site has to offer, it is very important that you experience this material with your body, emotions, and spirit, as well as your intellect. Make sure you check out the free meditations and guided imagery here at DrMiller.com. 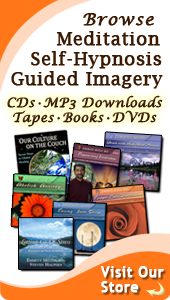 Many self-help and self-healing products in our online store will help you learn to embody these ideas. Deep relaxation lowers the resistance of your mind to new material, allowing new information in and literally reprogramming the nervous system. Needless to say, the effect of positive affirmations, used regularly, can be profound. During deep relaxation, the mental state you enter is similar to that of a young child who is so receptive to the words it hears. 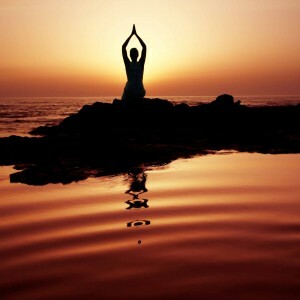 In the state of deep relaxation, other self-help and self-healing techniques such as guided imagery, affirmation, and other stress management techniques function much more powerfully. One of the main benefits of using such relaxation techniques is that you are able to exercise control over the thoughts that enter your mind ; you can choose which thoughts to keep and which ones to release. Clearly, the more control you have over the thoughts that flow through your mind the better you can guide the healing process: from image, to chemical or electrical activity, to an actual change in the muscular responses of, let’s say, the blood vessels in your sinus tissue, to the production of a certain kind of cells in your immune system designed to destroy a specific virus, to the creation of new cells to repair a cut finger. All these factors are involved in the mind-body connection that we work with in deep healing. To understand them at this deep, submicroscopic level is to begin to grasp the power we each hold to change our lives for the better—or, as it were, in the opposite direction. Excellent programs for learning deep relaxation include Healing Journey, Letting Go of Stress, I Am, and Relaxation and Inspiration (audio and video). Those with anxiety may want to add Abolish Anxiety to a deep relaxation program. For a more complete stress management experience, the Stress Comprehensive Program is recommended. The Serenity Prayer and Personal Excellence are good examples of programs that help empower the spirit in your healing. Writing Your Own Script and I Am focus on putting the wisdom of the spirit in charge of your behaviors and self-image.